You are currently browsing the archives for the Application Instructions category. Professional tennis players maintain a brutal schedule of training and tournament play. With major events scheduled throughout the year, there is no “off season” for touring tennis pros. Maintaining such a high level of activity week after week and month after month takes a toll on the body. Tour players are continually dealing with a host of aches and pains, ranging from annoying overuse syndromes to major traumatic injuries. Kinesiology tape provides athletes with a solution for working through minor injuries and recovering faster from major injuries. In addition, it can enhance endurance and performance during training sessions and matches, as well as accelerate recovery after intense exercise. Unlike traditional athletic tape that is tight and restrictive, kinesiotape provides support without limiting range of motion. It is water resistant and breathable, and can be worn for up to 5 days, even through intense exercise, showering or swimming. 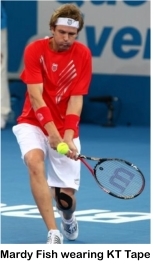 No wonder we’re seeing players sporting colorful configurations of kinesiology tape at all of the major tournaments! Swollen ankles are one of the most common miseries of pregnancy. Fortunately, kinesiology taping can provide a safe, simple and convenient remedy for this, as well as many other miseries of pregnancy. This is the second in a series of posts covering the use of kinesiology tape for the discomforts of pregnancy. The kinesio taping technique used for swelling and edema is called lymphatic taping. It involves applying the anchor end of the tape close to the lymphatic drainage ducts, with “fingers” of tape extending along the nearby lymphatic channels. The tape is applied with a light stretch, lifting the skin just enough to relieve pressure on the lymphatic vessels, allowing them to drain excess fluid more efficiently. The makers of RockTape Kinesiology Tape have provided a series of simple taping instructions for common pregnancy complaints. The following illustration shows the lymphatic taping technique to use with ankle edema. To cut a fan strip for a lymphatic taping, take a strip of kinesiology tape and make several longitudinal cuts beginning at one end and finishing 3-4″ from the other end (the anchor end). For ankle edema, the anchor end is applied above the ankle and the “fingers” are spread out directly over the swollen area. If necessary, multiple fan strips can be cut and applied crossing over each other. This is the first in a series of posts providing instructions for taping a variety of conditions related to pregnancy. The physical changes associated with pregnancy put strain on many different parts of the body. The accompanying swelling, aches and pains can make the latter stages of pregnancy extremely uncomfortable. With the precautions against taking medications while pregnant, it can seem as though there are few solutions to deal with things like back pain, swollen feet, carpal tunnel and more. Kinesiology taping is an ideal solution for all of these issues. The soft, elastic tape is comfortable to wear and it contains no medications. It’s hypoallergenic acrylic adhesive is safe and non-irritating. And, the best thing about kinesio taping during pregnancy is that is can dramatically relieve many of the physical discomforts that can make life miserable. Begin by cutting 2 pieces of tape, approximately 3 feet long. Remove the backing from the end of one piece and apply it over the hip area (photo 1). Have the subject hold her arm above her head as you apply the kinesiotape in a spiral pattern along the lower margin of the abdomen, over the ribs and up the back, finishing just above the opposite shoulder blade. Repeat the process starting on the other hip. Cut two more strips of kinesiology tape, each approximately 15″ long. Have subject hold both arms above her head.Apply the end of the first strip just above and to the side of the pelvic bone, then run the rest of the strip straight up over the abdomen, finishing on the ribcage just below the breasts. Repeat on the other side with the second strip of tape. Rear view of completed taping. Remember that, if properly applied, most kinesiotaping applications can be worn for up to 5 days. This makes kinesiology tape a convenient and cost effective way to deal with the discomforts of pregnancy. Any of these issues can delay an athlete’s return to full functioning, or even contribute to additional injuries. Fortunately, this is where kinesiology taping truly shines. A well-applied kinesio taping application can address all of these issues and more. I recently returned from the PowerTaping certification seminar conducted by RockTape. In this seminar I learned about a 3-step taping protocol that is ideal for athletes who are returning from an injury or who need to continue training or competing with an injury. This taping technique can be done using any of the major kinesiology tape brands – Kinesio Tex Tape, RockTape or SpiderTape. Preload the muscles by placing the affected area into a position of maximal stretch. Take your time with this step – it puts the tissues into a condition to receive maximum benefit from the tape application. Active techniques could include dynamic stretching, yoga poses or myofacial release techniques (rollers, balls, etc.). Once the maximal stretch has been achieved, this position should be held throughout the taping. Apply one or more “decompression” strips directly over the most painful areas. This technique involves applying a fully stretched (except for the ends) strip horizontally across the affected muscle group. For large areas, several strips can be applied. The lifting action on the skin will provide pain relief and enhance local circulation to reduce inflammation and keep the tissues well-oxygenated. Apply “stabilization” strips around the perimeter of the affected area. This is a good place to use Y-strips, with the base at the lower end of the muscle group and the tails running vertically around the outer boundaries of the muscles. This part of the taping will support the injured area, while still allowing a full range of motion. In addition, the sensory feedback from the tape will discourage the athlete from engaging in harmful or inefficient compensatory movement patterns. “RockTape” and “PowerTaping” have been all the buzz lately, ever since NBC profiled these exciting new kinesiology taping products during their coverage of the Winter Olympics. My last post featured an overview of RockTape, also referred to as Power Tape, plus a video of the NBC segment. 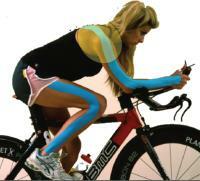 Going hand-in-hand with RockTape is an innovative new kinesiology taping method called PowerTaping. Rather than taping an isolated joint or muscle group, PowerTaping protocol focuses on the entire chain of joints, muscles, fascia and nervous system components responsible for specific movement patterns. The result? Improved efficiency of movement, structural reinforcement of correct motor patterns, and improved fluid dynamics, which all contribute to reduced fatigue, faster recovery and improved biomechanical function. The image above illustrates one of the possible sport-specific movement chains for cycling. The upper body taping reduces fatigue and muscle vibration in the shoulders, upper arms, forearms and wrists – areas that fatigue in events such as time trials. Note: The PowerTaping Manual is written for sports practitioners, and demonstrates how to apply RockTape power tape to increase athletic performance. It also provides an overview of the science behind the protocol.